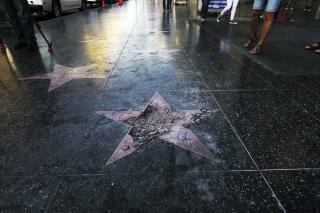 (Newser) – President Trump's star on the Hollywood Walk of Fame has had a rough go of it lately, having been hacked at with a pickax last month and the subject of a unanimous (but essentially symbolic) vote by the West Hollywood City Council on Monday to have it removed. Now, a reversal of fortunes: It's multiplied to cover at least 50 squares. That's thanks to a unnamed conservative street artist who says the prior two events spurred him and his partners (self-dubbed "the Faction") to plaster $1,000 worth of stars made of adhesive-backed floor vinyl on the Walk of Fame. Clearly Trump paid for this or his rich tool cronies paid for it. They were made of vinyl like his hair and face. They were removed just like the illegitimate one awarded to him as a fake actor and fake president. Soon will come a day when all things Trump are permanently excised and his disgraceful name will be too shameful even for racist idi0ts and rightwing m0r0ns to mention anymore.